Hi everyone! Who's excited for the long holiday weekend? Does anyone have any fun plans? Next week I'll talk more about what I'm up to, but I've been looking forward to it for a while! Today I'll be sharing some amazing recipes for the 4th of July. 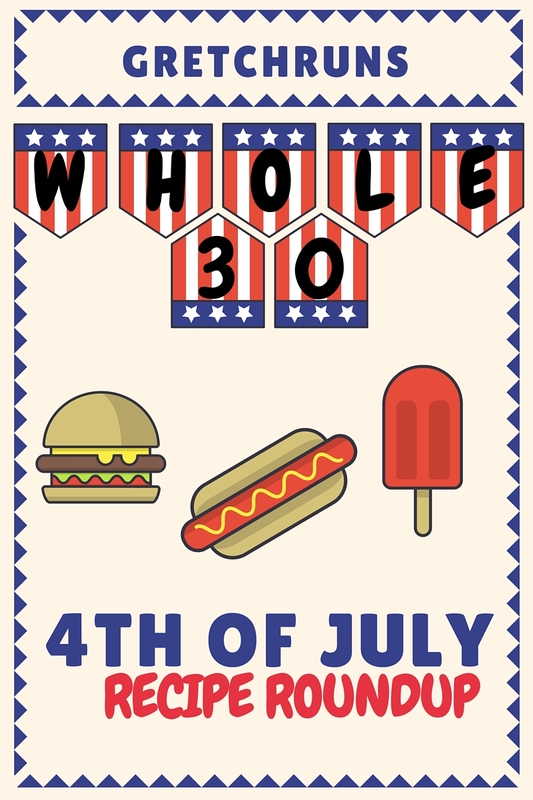 You won't believe it by looking at the mouthwatering pictures or trying them out for yourself- but these are all Whole30 compliant! Since I'm still on my Whole30 (more like a relaxed Mostly-Whole 70), I wanted to show you all that you don't have to sacrifice taste or picnic fun to stay compliant. I'll be sharing some recipes from my blogging buddies, but let's start off with some drinks that I'll be making! You might have to miss out on wine coolers or beers during the Whole30, but these drinks are refreshing, delicious, and won't leave you feeling bloated when you want to change into a bikini and jump into the pool! Mix first three ingredients, pour over ice. Garnish with blueberries and strawberries, and enjoy! In a blender, blend together strawberries, raspberries and orange juice. Pour evenly into two glasses or one giant glass, and set in freezer. Clean out blender, then blend together banana and 1/2 cup of milk. Pour over top of red layer, and set it back in freezer. Clean out blender, then blend together blueberries and remaining 1/2 cup of milk. Pour into glasses over top of red and white layer. If you need more inspiration, check out these posts! To my international readers- what do you usually have at picnics/cookouts? Yum! Those drinks look delicious. I don't drink alcohol but sometimes want a fun drink, so they are perfect for me. Happy fourth weekend! Thanks Kate! Hope you enjoyed the holiday! I can't wait to try it out too! This all looks SO good! Would seriously never know that any of this wasn't "normal" picnic food! All of these recipes look so so good! I wish that it was summer here in Australia as I loveeeee picnics and get togethers but instead we're doing everything we can to stay inside, haha! Hopefully it'll warm up there soon! Good luck if you end up doing it! The skewers look bomb! Andrew loves pineapple with his savory food so I KNOW he would love this. Happy 4th!! He would definitely love it! Thanks Suzy! oh wow, those turkey burgers look AMAZING.